Planning a Wedding at home? Will your Homeowners Policy cover you? The wedding ceremony in your parent’s back yard was more beautiful than you imagined. Later in the evening, the reception is in full swing when a scream pierces the music on the temporary dance floor. One of your parents work friends – a highly successful yoga instructor– has slipped on some spilled wine and torn all the ligaments in her knee. She will be in a cast and unable to work for six months. She will not be able to make the $15,000 per month that she has been earning for her classes. Worse, she has no disability insurance. Within weeks of the wedding, a lawyers letter arrives demanding compensation for lost wages due to the hosts negligently failing to clean up the wine hazard on the dance floor. The letter also demands compensation for rehab expenses. The parents call their homeowners insurance broker only to be told that they needed to take out wedding event insurance in order to be covered. Their homeowners policy will not protect them for a wedding they host at their home. The bride’s parents are now in the awkward position of having to defend themselves from a lawsuit from their friend. This is a difficult, pricey lesson that is better learned before there is a loss. 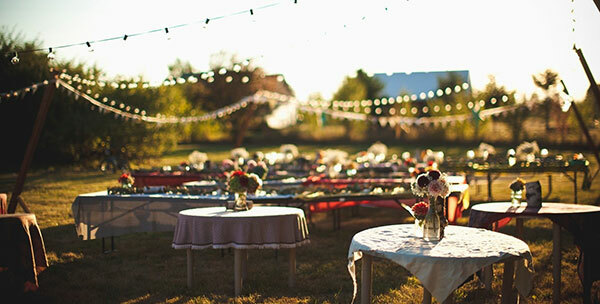 Our experience tells us that many wedding hosts assume they are covered by their homeowners insurance policy when in fact they most likely are not. This messy scenario is easily avoided with inexpensive online wedding insurance. If you use your home for a wedding, check your insurance policy and make sure your coverage is appropriate. If not, Front Row Insurance Brokers have created a 5-minute Online Insurance Solution! 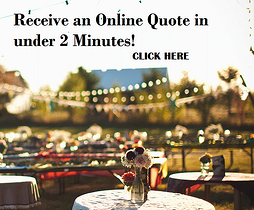 Our online wedding event insurance policy is available in all provinces in Canada. All rented equipment is covered for replacement cost for: theft, damage and fire. Up to $5,000,000 in wedding liability insurance to cover damage to the wedding venue and injury to guests and vendor staff. Will also provide lawyer costs. Unlimited Additional Insured certificates for your wedding venue and vendors at no additional cost. Insurance for weddings is a specialty of Front Row. We make it easy to protect your special day – at a cost that could be less than a bottle of champagne. Pop! Pop! Wedding insurance allows you to relax and enjoy the big day. Weddings cost an average $30,159 in Canada . The hall, the food, the DJ, flowers, photos and all the other costs add up to an expensive day. Wedding insurance provides you with peace of mind in two ways. Wedding property insurance provides coverage for damage to: your wedding attire, lost/stolen gifts, photographs,– even wedding ring insurance and more. Wedding liability insurance covers you when you are legally responsible for injury or damages that occur at your wedding. If one of your yoga teacher guests slips on spilled wine and tears knee ligaments and cannot work they may sue you for lost income and rehab / medical costs. Wedding liability insurance also provides a lawyer to defend you. Protect your special day in less than 6 minutes and pay with a credit card. Our wedding insurance cost starts as low as $55. Quotes take 2 minutes and are offered free without obligation on our online site. Planning a wedding? There are many risks associated with hosting a wedding: your guests may damage the venue or the rented furniture or the sound system. Your guests could trip on temporary carpeting or a wine spill on the dance floor and injure themselves. When hosting a wedding, most banquet halls and venues will require you to have event insurance in place. Often the hall will tell you in their contract the short term venue liability amount required. Policies start at $55 and certificates for your wedding venue and vendors are free. If you will be serving alcohol at your wedding make sure that you request venue alcohol liability – available through our online site . Remember, as a renter you are responsible for the safety of any guests. You could be held legally responsible if people consume alcohol during your wedding and harm themselves or someone else.